Welcome, friends! 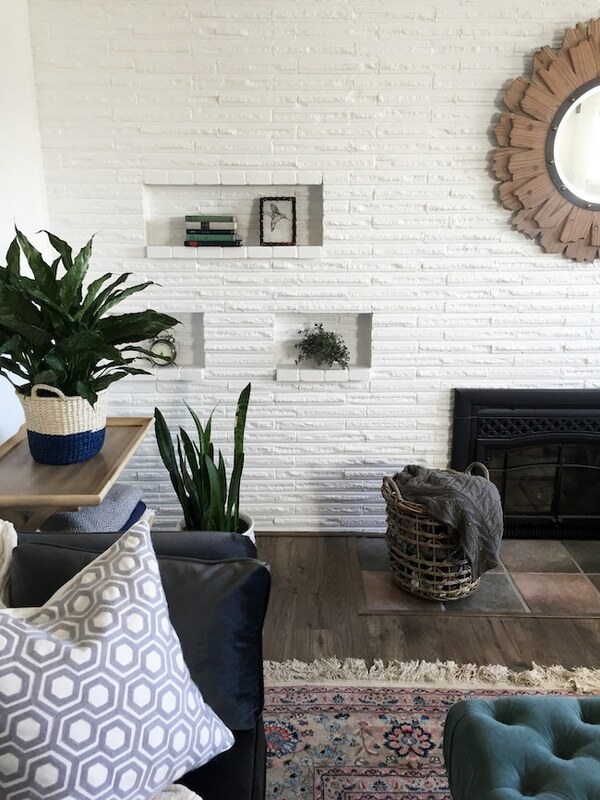 I’m so excited to finally be able show you the progress in our lower level family room, featuring our beautiful new Mohawk flooring! 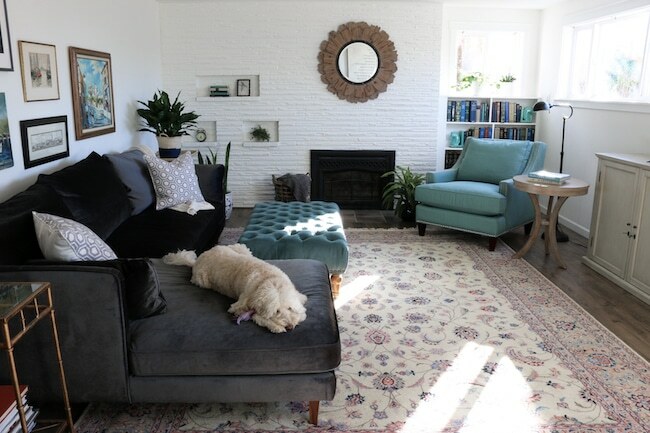 If you missed the before post about this room yesterday, you can catch up here. We are so pleased with our floors and how this room is coming together. The new flooring was installed the week before Christmas! 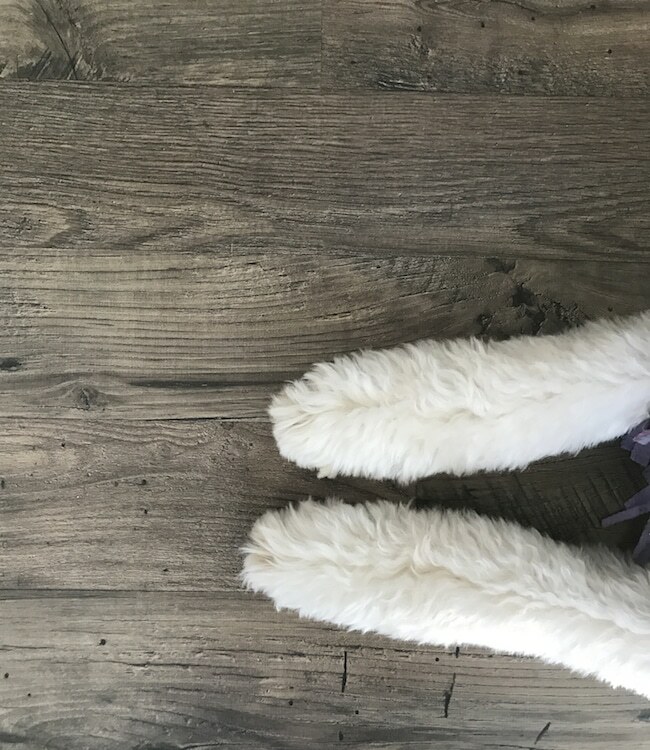 Our house was in chaos that week with all the projects we had going on at the same time, so I was thrilled about how quickly the flooring was able to be installed so we could get on with the holiday festivities. The transformation was literally a one-day makeover. I know! It was a dream. If only every other project was completed in a day. Since these floors are pre-finished, there is no sanding or staining or sealing after installation. (You can look back at the installation photos in the before post). So if you are looking for one of the fastest and most significant improvements you could make to a room (in addition to paint!) 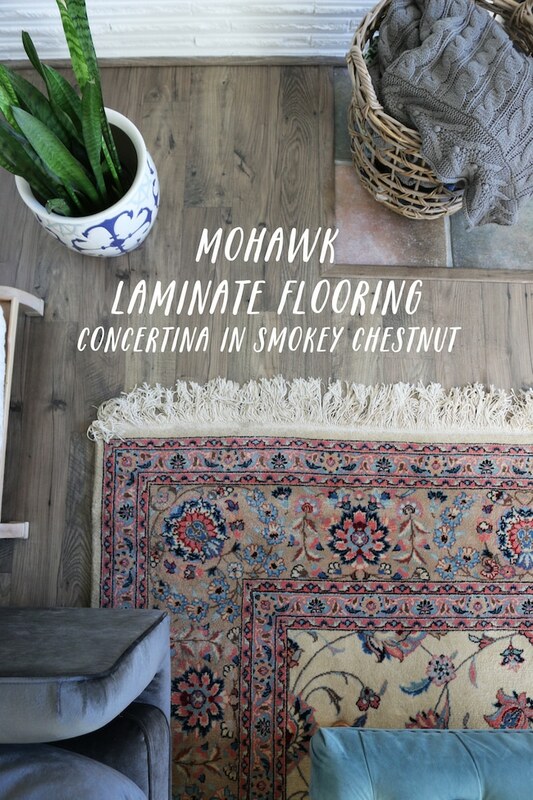 I’d definitely recommend considering Mohawk’s pre-finished flooring. It’s so gorgeous! 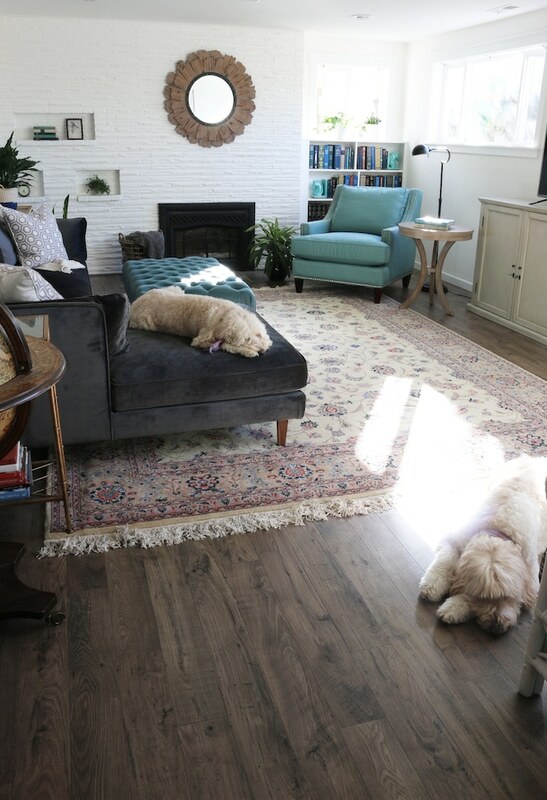 This is our second home with Mohawk flooring (we loved the Mohawk pre-finished wood floors in our last house, you can find them here). Remember where we started with the swine-colored walls, pink blinds and old carpet? 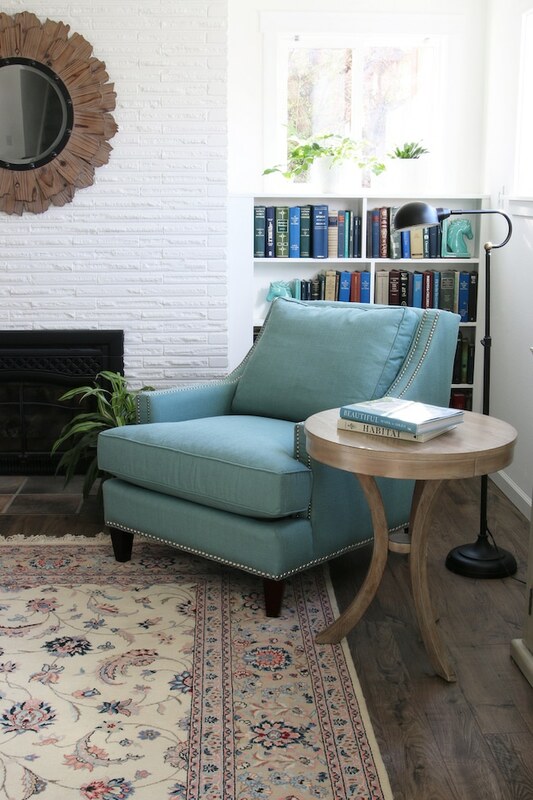 Fresh paint and new flooring does wonders to provide a nice backdrop for a room, doesn’t it? 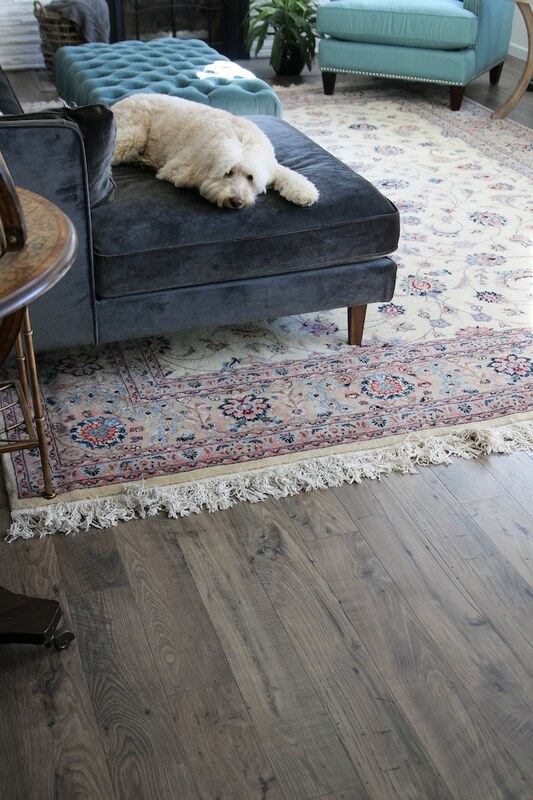 Flooring makes up such a significant portion of any room that when it is updated, the entire look and feel of the space improves right away. 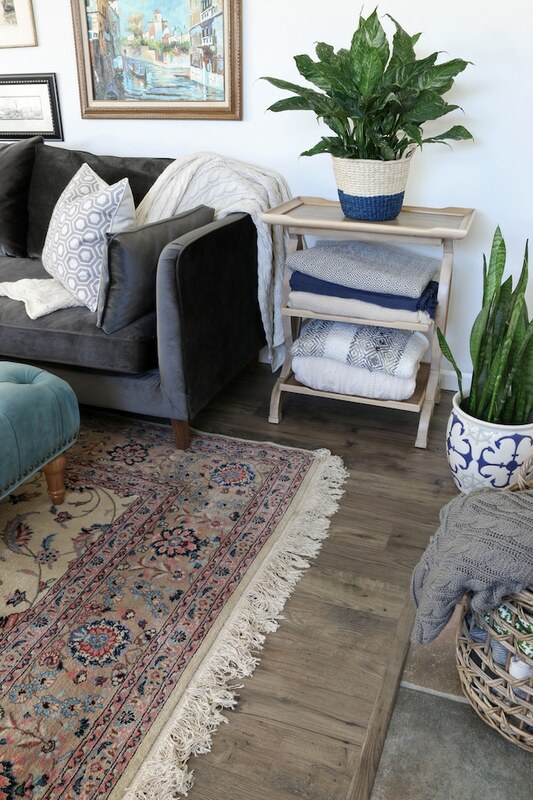 I’m so in love with the natural more rustic texture, the matte finish and warm tone of our floors (they are the Concertina laminate flooring in Smokey Chestnut). The look feels traditional, but still up-to-date. 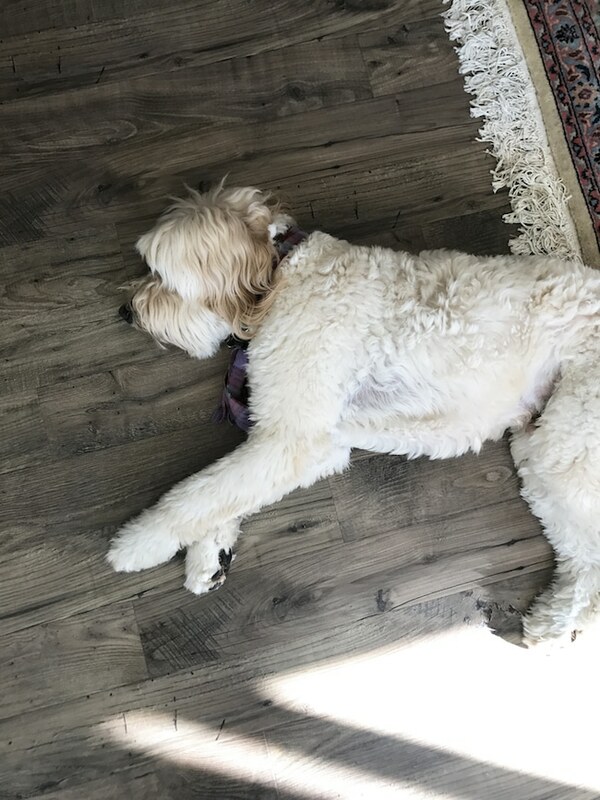 The new flooring actually makes it feel like we added on an entire new area of the house because we are so drawn to this space now. 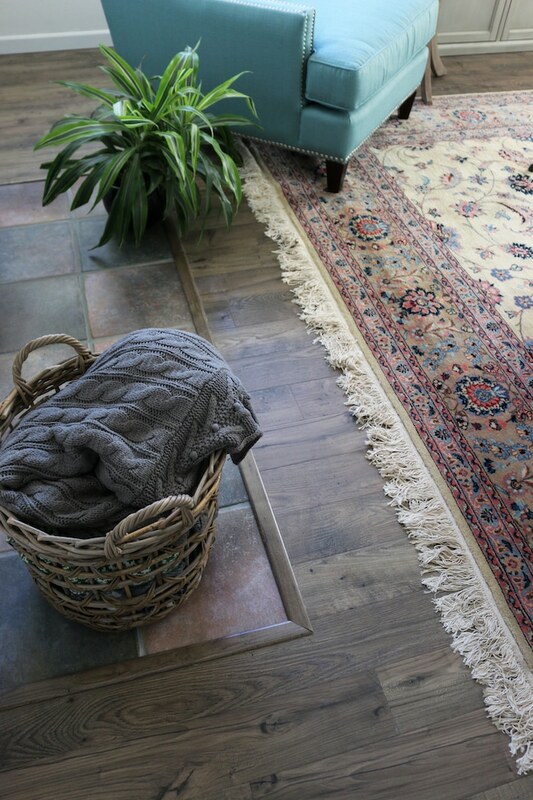 The warmth of the flooring is so inviting for a cozy family space. It feels comfortable, cleaner and more stylish, so we definitely enjoy being in the room so much more than we did before. Besides the new paint and flooring, we did get a cozy new sofa awhile back (we sold our big sectional when we moved). 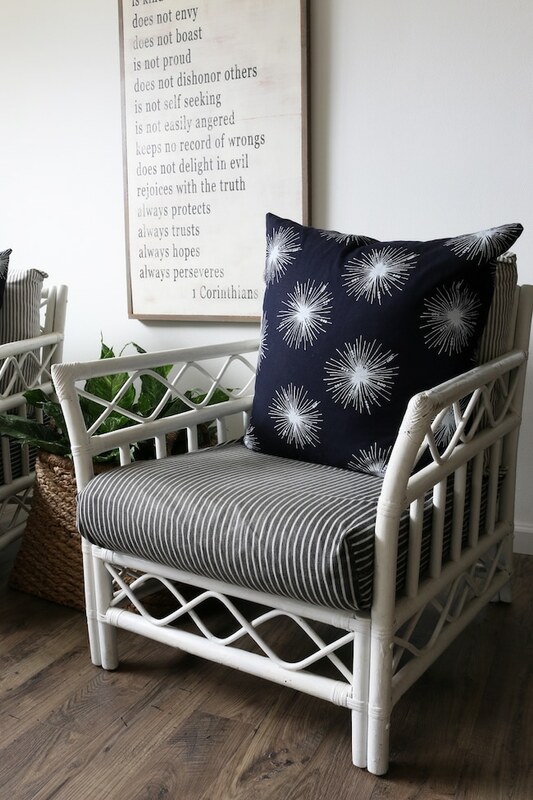 I’ll tell you more details about the sofa in a future post, but it is from Interior Define and we love it. 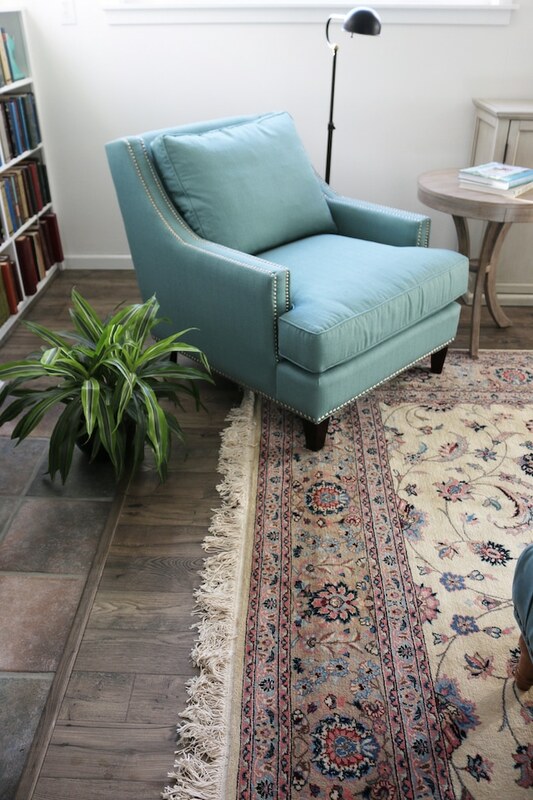 The wood Persian rug has been in our family for years. You will probably recognize everything else in the room, we are just using what we had at this point! We still have more to do in this room, but it’s nice that it already feels great to be in it just as it is. We had family coming from out of town just days after the install, so the floors were christened right away with all types of holiday activities. The floors held up beautifully as we moved furniture around, four dogs ran in and out of the house with muddy feet, and as kids and family ate meals and hung out together playing games. 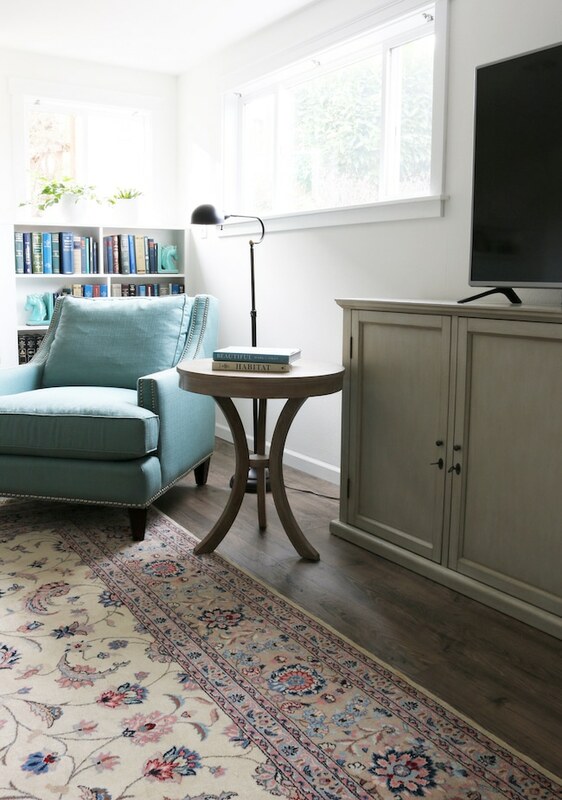 We really needed flooring that was not overly sensitive to everyday use, and they’ve already passed every test in our book! The wall behind these chairs is the brand new wall we installed. The other side of this wall is our new office, which I will show you in an upcoming post! 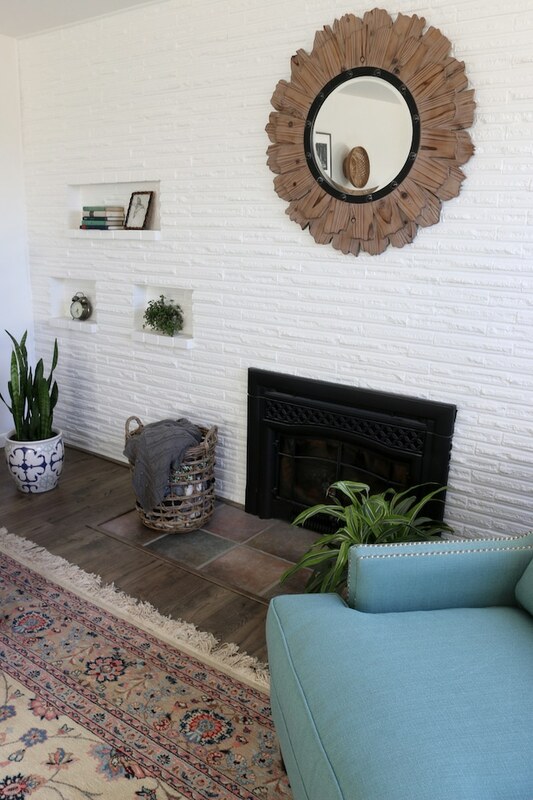 (I’ll show you the before and afters of the wall addition, too, so you can get better perspective on how this room has changed overall). Let’s look back one more time at the before and after shot, shall we? Besides the new wall that was installed (more to come on that), we’ve painted the swine-colored walls and fireplace (Simply White Benjamin Moore), added some trim around the fireplace (to fill in big gaps between the brick and the drywall), removed the pink blinds (still thinking about what blinds we’d want down here) and installed the new Mohawk flooring. So much fresher! We still have more things we’d like to improve or add in this room over time, of course, but we are definitely happy with how far its come over the past few months. 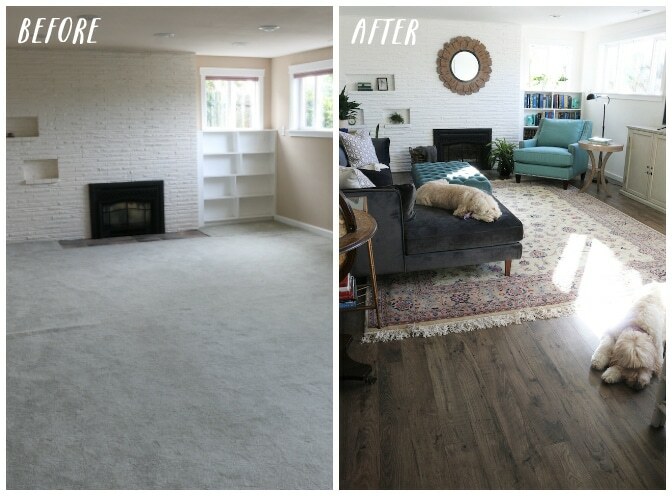 Thanks to Mohawk for providing the beautiful flooring for this makeover. 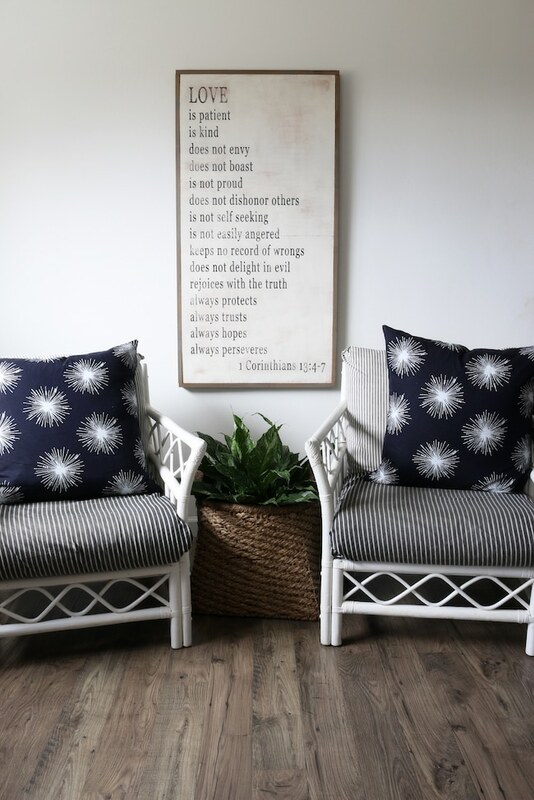 To read this post in its entirety on The Inspired Room, click here! My name is Melissa! 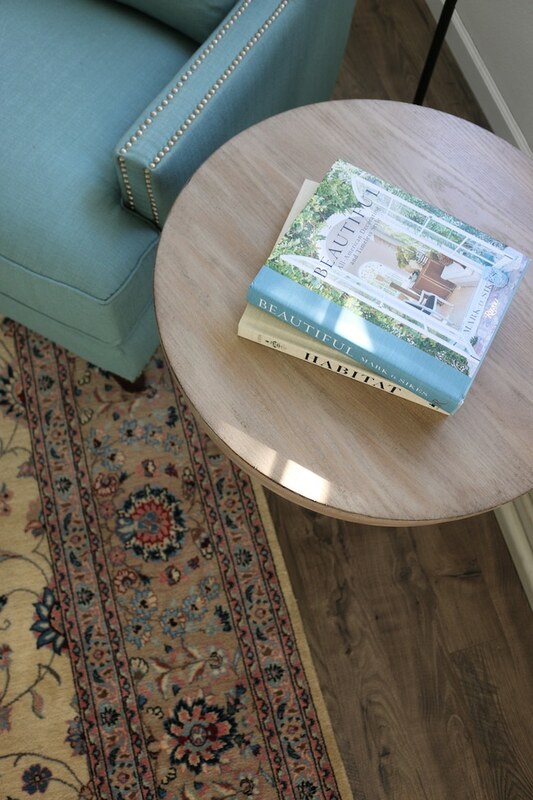 I’m here to share simple, doable ideas for loving the home you have. No big budget, complicated skills or fancy power tools required!